Children need products that are mild and gentle and which contain zero nasties. All Childs Farm products contain certified organic essential oils and do not contain Parabens or artificial colour that can irritate the skin. They are also the only children's product to use highly acclaimed Argan Oil in their ingredients. These bath products contain scents such as strawberry and mint, tangerine and sweet orange to make sure your children are squeaky clean. Each and every part of the processes have been done in Great Britain too. Every picked strawberry, every squeezed orange, all the mixing and fixing have all been done right here in the great British countryside. 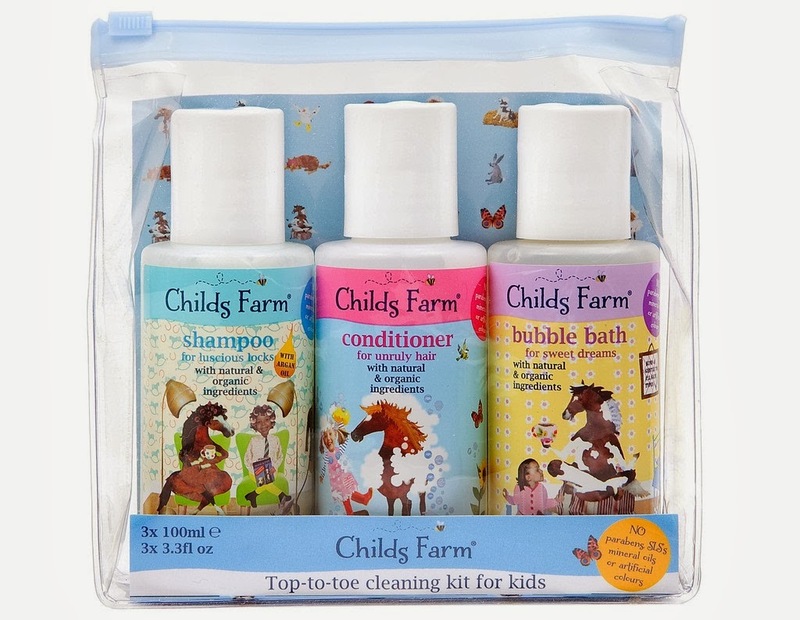 We were lucky to receive the newly brought out Childs Farm Top-to-toe cleaning kit which contains travel-sized bottles (100ml) of ‘Groomed to Perfection’ Shampoo for luscious locks, ‘Tame that Mane!’ Conditioner for unruly hair, and ‘Clean, Calm and Collected’ Bubble bath for sweet dreams all tucked up into a clear pouch. And I have to agree with them. Since using the products, Thomas and Charlie's hair has felt a lot smoother and more healthier as well as feeling hydrated and not 'dried out'. Such a great little set and I'm sure we'll be using more of this in the future although I am sure I will buy the bigger sizes as these travel sized ones didn't last very long especially when the boys got hold of them. The bubble bath made loads of bubbles from just a few drops and the scent it emitted was lovely and even made a fun game as Thomas tried to guess what was in each of the products by scent alone. 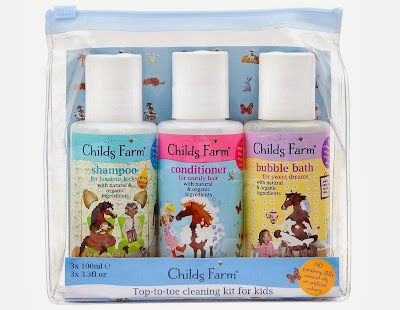 Childs Farm Top-to-toe cleaning kit for kids retails at £9.35 and can be purchased online at Childs Farm or at Ocado, John Lewis and various other stockists too. I'm entering your giveaway to win for my eldest daughter, whose birthday falls in December but I have just ordered a set for my niece who turns 5 in just over a week. She is a real girly girl and loves anything to do with horses and ponies! She will love it!